In 2015, Experience Scottsdale decided to revitalize its destination marketing by creating a brand that better spoke to current and future travelers. During Experience Scottsdale’s nearly 30 years of existence, travelers have changed. Over time, their needs and wants in destinations have shifted. With this in mind, we sought to create a new brand that would be ownable, authentic, energetic, approachable, unexpected and diverse. A new brand that would raise awareness, tap into key audience motivators, and attract a broader audience. To accomplish this, we evaluated our previous brand, uncovered consumer perceptions of Scottsdale, and refined strategy. After months of research and testing, we identified Scottsdale’s authentic story. And we’re thrilled to finally share that story with the world. Here in Scottsdale, our unique story is about how much better we make our visitors feel when they’re here. It’s a story of both excitement and relaxation; a story of discovering something unexpected in our stirring beauty and desert experience; a story of Effortless Revitalization. As we begin this new brand journey, we’re debuting our Absolutely Scottsdale advertising campaign to showcase our new brand personality and redefine perceptions of the desert. Our desert is absolutely hot, dangerous and wild – both literally and figuratively. And that’s why we love it. 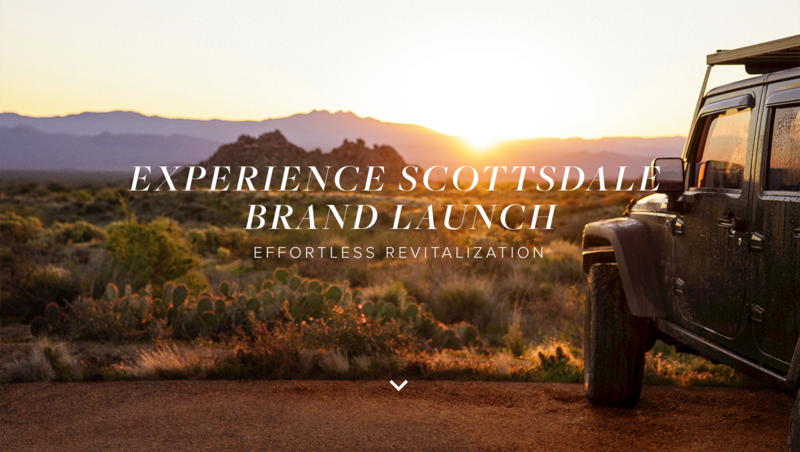 On this website, we chronicle the launch of Experience Scottsdale’s new brand, advertising campaign and corporate identity. Explore the research behind the brand, view the new campaign, and get behind-the-scenes insight into the process. We hope you find your own Effortless Revitalization in Scottsdale!